Begun in 2006, Good to Grow! is the Association of Children’s Museums’ nationwide health initiative. A key feature of Good to Grow! 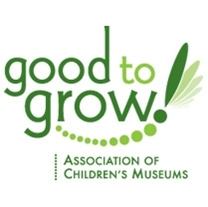 is the "Growing Healthy Museums" project. It benefits more than 300 children’s museums that in turn have the potential to engage millions of children and families in making healthy choices. Based on an in-depth self-study tool, the project aims to increase the capacity, knowledge, and skills of museums to promote health and wellness in their communities. As part of its self-study, the Creative Discovery Museum in Chattanooga identified key community needs; environmental health was a critical concern. According to Executive Director Henry Schulson, "Our goal is to use our resources to benefit children and families. And this community sees the environment as fundamental to its health." Through a partnership with Oak Ridge National Laboratory and the University of Georgia, the museum created an environmental curriculum now used in science classrooms across the state. The curriculum also serves as the foundation for the museum’s "Biofuels Family Night," which engages parents and children around the "essential ideas" of alternative energy. Hands-on activity stations around the museum pose thought-provoking questions that encourage critical thinking and intergenerational dialogue around environmental issues. Knowledge and skills are reinforced at the end of the workshop with a wrap-up session that reviews key concepts from each activity. Such an outward focus on audiences is a hallmark of Good to Grow! museums. Participating institutions assess their current resources, develop an action plan that prioritizes the local community’s needs, engage key local partners, and empower the museum’s staff to evaluate their progress toward achieving their objectives. Progress is measured against metrics that include the museum’s connection to the local community, knowledge of health and wellness issues, and knowledge of audience groups. Good to Grow! embraces a vision of museums as resources that catalyze communitywide health and environmental literacy.